Every year we travel hundreds of miles throughout the UK, Europe and Scandinavia, buying stocks, collections and accumulations. John started this in 1970 and we continue to do the same thing to this very day! 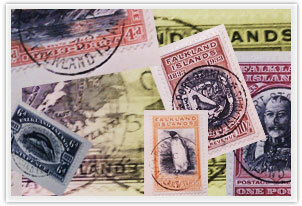 We buy virtually anything in stamps and covers, from specialised one-country collections to general lots and accumulations, from better quality single items to complete dealer's stocks. If it's philatelic, we're interested. ACCURATE VALUATIONS - We have over forty years full time experience as a major buyer in the stamp trade, and we buy from all the main UK & European auction houses. We make accurate, efficient valuations based on the very latest market values. FAIR VALUATIONS - We work on high turnover with low profit margins, this means we must buy - and pay the top market price to make sure we do. We cannot afford to waste our time and yours by making unrealistic offers which will not stand comparisons. IMMEDIATE PAYMENT - All our offers are backed by immediate payment. We agree a price and you get paid there and then. It's that simple. HOME VISITS - We travel extensively, which means we can easily arrange to view bulky, valuable collections in your own home - at no extra cost to you. PTS MEMBER - As a PTS member for over 20 years we have signed up to a code of ethics that states: ‘All forms of business and business practice in connection with stamp dealing shall be carried out creditably and with professional integrity to the highest commercial standards and the principles of good trading shall be upheld’. The majority of the collections we purchase are from auctions, and usually at well below our top bid. If those people had sold directly to me they would have been paid more, paid immediately and would not have paid commission or gone to any other expense.